Elland CE Junior & Infant School in Halifax, North Yorkshire, are winning their pupils over with their tantalising, tasty, and yes healthy, tuck shop ideas. School lunches are made on site and the tuck shop trolley is set up by one of the catering staff each morning. The trolley is made available twice a day at break time and at lunchtime and everything on the trolley costs just 20p. Care is taken to make sure the trolley looks appetising and appealing to the children. 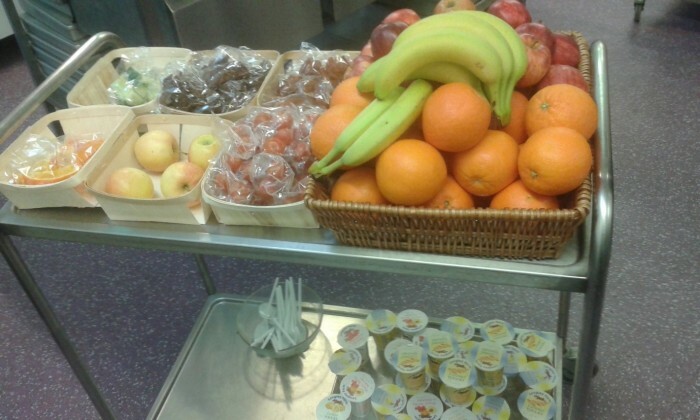 There is a standard daily offering: apples, bananas, oranges, sultanas, dried apricots, cucumber sticks and yogurts. The remainder of the trolley depends upon what is in season and what has been left over from school lunch the day before. Whilst the team mostly use seasonal fruit & veg, they do like to offer a variety of fruit when possible to give the children a chance to try something new. It is not unusual to find things like starfruit and passion fruit offered in bags some weeks. There is little profit in the tuck shop, sometimes it might only a couple of pence per item, but it does cover the cost of the foods offered overall. Costings are done by Pier (the chef) with regards to items sold and for quality control there is a list of amounts per bag for dried fruits and every day offerings. The 20p does not cover the cost of the member of staff putting together the trolley, but she spends 20 mins a day making up bags and laying the trolley out, and if she has a spare 5 minutes she overproduces dried fruit bags for later in the week. The school invested in a bag sealer which cost around £140 as they use it for other things too. The caskets on the trolley are recycled and are what fruit and veg are delivered to the school in from the suppliers.